Print Conductor is a simple batch printing utility. If you regularly have to open and print a large number of files, this elegant tool can be a real timesaver. Once you tell it which files to print, Print Conductor automates the rest of the process. Print Conductor is easy to use. Create a list of files to be printed. All sorts of formats are supported: Adobe PDF, Microsoft Office (Word, Excel, Visio, PowerPoint, Publisher), Autodesk AutoCAD, HTML, SVG, etc. Print Conductor supports exporting file lists, which is helpful if the same files will be printed again later. After creating the list, select the printer you want to use. Any installed printer, including virtual printers, may be selected. The only thing left to do is click a button to start the print job. Source DocumentsSupports printing of Adobe ® PDF files, Microsoft ® Word DOC and DOCX documents, Excel XLS and XLSX spreadsheets, PowerPoint PPT and PPTX presentations, Visio VSD drawings, Publisher PUB files, Autodesk AutoCAD ® DXF and DWG drawings, OpenOffice ODT documents, JPEG, TIFF, GIF, PNG, PCX, TGA, DCX and BMP images, XPS, SVG, TXT, WRI, RTF and HTML files. At each moment the user knows how many documents have already been printed and how many remain in the queue. Any documents that failed to print are also reported to the user. After processing the entire list of documents, the program produces a detailed job report. printers-icons-140Print Conductor can print documents on any type of printer: local printers, network printers or virtual printers. Additionally, the user can adjust the settings of the selected printer. You can convert list of documents to PDF, TIFF or JPEG in case if you use Print Conductor together with virtual printer software like Universal Document Converter. for specific documents types. Sort documents by file name or type, preview them before printing, and/or print a subset of the documents in the list. Document lists can be saved to file for subsequent reuse. 123cubesPrint Conductor has a simple and intuitive interface. It is compatible with all the latest versions of Microsoft Windows. So you can start printing documents immediately after installing the program - no need to spend time mastering the product. 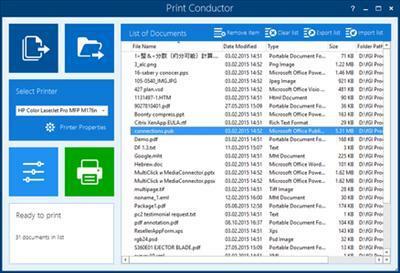 Print Conductor offers a single interface for printing and converting various types of documents. You won't encounter any problems - even if your system administrator installs a new version of Microsoft Office or Autodesk AutoCAD. Print Conductor 5.1.1604.12140 download links are externally hosted on Extabit, Rapidshare, Rapidgator, Netload, Uploaded and Print Conductor 5.1.1604.12140 also available directly on Torrent Sources.